Milan's Krzysztof Piatek (Centre) tries to beat Atalanta's Rafael Toloi. Krzysztof Piatek hit a wonder goal and grabbed a second as AC Milan came back to defeat Atalanta 3-1 on Saturday and stay on course for the Champions League. Piatek took his season's Serie A total to 17, just two behind Cristiano Ronaldo. The Polish star now has scored six times in four starts for Milan since moving from Genoa in the January transfer window to replace Gonzalo Higuain. 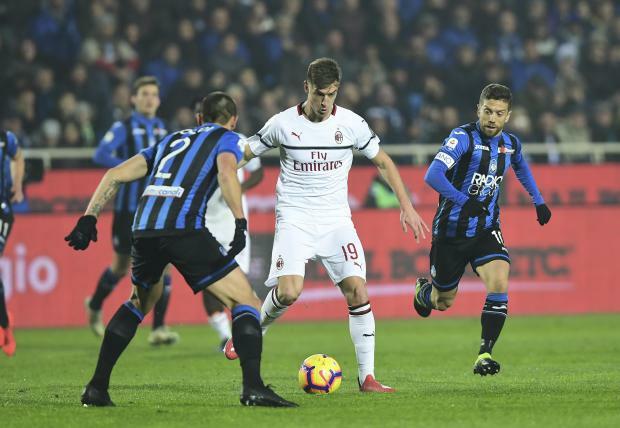 After Remo Freuler had given Atalanta a 33rd-minute lead, Piatek struck with a memorable left-footed volley in first-half stoppage time. Krzysztof Piatek with one of the best goals I’ve seen in a while. Ricardo Rodriguez swung in a cross from the left, Piatek nipped in front of his marker before volleying into the top corner from 12 yards out despite not even looking at the target. Turkish winger Hakan Calhanoglu put Milan ahead with a sharp drive 10 minutes into the second period before Piatek headed in from a corner just after the hour mark to seal victory. Milan fans have taken Piatek to their hearts, even devising a new chant "Piatek! Pum pum pum pum!" to mirror the striker's goal celebration of a pistol-shooter. Gennaro Gattuso's Milan stay in fourth spot but they now have 42 points, four more than Atalanta, Roma and Lazio.